On average, 8.8/10 adults (88 percent) spend more than two hours each day using a digital device, with 1 in 10 people spending at least 3/4 of their waking hours on a digital device. This constant exposure to technology is a shock to our eyes with 65% of Canadians reporting symptoms of digital eye strain, such as dry, irritated, eyes, blurred vision, eye fatigue, neck and back pain and headaches. Digital eye strain is the physical discomfort felt after prolonged exposure to digital screen and is associated with the close to mid-range distance of digital screens, including desktop and laptop computers, tablets, e-readers and cell phones. It is not uncommon to start experiencing symptoms after spending two or more hours staring at a device, or more realistically, multiple devices. In fact, on average, 75% of people who use two or more devices simultaneously report experiencing symptoms of eye strain compared to only 53% of people who use just one device at a time. Blue light, which is another name for high energy visible (HEV) light in the blue and violet part of the light spectrum, is a particularly intense light wave emitted by the sun and many modern electronics, including computers, tablets, smartphones, as well as LED lights and compact fluorescent light bulbs. Blue light can cause eyestrain and fatigue. Studies have implicated blue light in the development of cataracts, and macular degeneration. 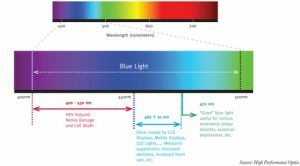 Just as we became aware of the damage done by ultra-violet damage in the last 100 years, we are now becoming increasingly concerned with preventing damage from blue light. Luckily there are tools available to help technology users alleviate the discomfort of digital eye strain, minimize vision problems and prevent further eye discomfort. When used in tandem with practical “eye-gonomic” health tips, lenses tailored for digital screen use (computer eyewear) can reduce or even prevent digital eye strain. If you are interested in digital screen eyewear please contact us. If you think you may be suffering from digital eye strain and would like to book an eye appointment with one of our professionals please either fill out our form or give us a call at 604-946-7911.